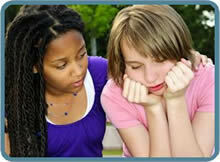 Home » Your Questions: Teens » What are my choices? You can choose to give birth. You can choose to make an adoption plan. You can choose to have an abortion. This decision is yours alone. Am I making this choice freely without being pressured or intimidated? Am I moving forward with a strong resolve to follow my inner voice? Is this a decision I can live with? Do I know my rights? How will this decision affect my future health? Am I trading current problems for future challenges? Have I gotten all the information I need to make an informed decision? Women who have made a past abortion decision share with us that they regret not having more information at the time they were weighing their options. A better understanding of prenatal human development. Full disclosure regarding the increased risk of developing breast cancer following an abortion. An understanding of how abortion can affect future emotional health. Awareness of how having an abortion today can affect future fertility. Referrals to community resources, assistance and support for women with young children. Help coping with the stress that follows an abortion decision. The strain of sharing an abortion experience causes 80% of relationships to break up. When you first learn the news that you are pregnant, it is normal to feel a variety of emotions such as shock, fear, anger, or joy. Once you have time to process that you are pregnant, you can begin to evaluate choices available to you. You have the choice to terminate. You have the choice to give birth. You can choose to parent. Abortion: If you are considering abortion, click on the following related questions for current information. What kinds of risks are there? You have the choice to choose to parent or to make an adoption plan. Both choices are honorable and worthy of respect. Do not presently live in a stable, supportive environment. Struggle to survive each day. Do not have the support of a parenting partner. Feel parenting a child at this time does not seem feasible. Want more for their child than they can provide. Answer: You can call: 888-598-5491 and speak with someone who will share information, answer your questions, and listen to your concerns. You will be given the respect you deserve, whatever decision you make. You will have the opportunity to ask questions, get the facts, and consider the long-term effects of this decision on your future, your relationships, and your health. Be informed. It’s your right. Taking care of YOU, the whole person, is imperative for total health.